RUNS ON XL/XE ONLY. Boot in Turbo Basic and all your existing programs will run up to 3 times faster! That's one immediate advantage but Turbo Basic is also a complete new BASIC programming language in itself that uses all of the Atari Basic commands plus dozens of additional programming techniques. 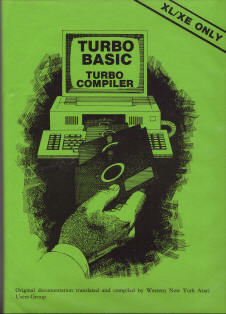 Whilst it is completely compatible with Atari Basic, Turbo Basic also offers many, many new or enhanced commands. How about these for example? Structured programming - REPEAT-UNTIL, WHILE WEND, IF-ELSE, DO-LOOP, define PROCedures and other commands that are missing from Atari Basic! General - Some incredibly useful functions that you will find invaluable. RENUMber your program, DELete lines, DUMP variables with current values, TRACE program execution, indented lines and more. And there are dozens more, over 60 new commands in fact! Some incredible time savers include DSOUND to shut off all sound channels, ERR and ERL to show errors, INKEY$ and INSTR for string manipulation. HEX/DEC conversion, TIME functions, FRACtions, DIMensioning of strings with null characters, the list goes on! But that's not all you get on the disk - read on! Turbo Basic on its own is worth a fortune but what if you also got a BASIC COMPILER that works not only with Turbo Basic but also any program you have already written in Atari Basic? That is exactly what you do get - and it works better than any of the (no longer available) commercial compilers! The Turbo Compiler compiles to code that requires a runtime package, included on the disk, but you can simply name any program as AUTORUN and immediately have your own boot disk. You won't believe the speed - up to fifteen times faster! You will have to rewrite some of those games because they will be too fast to play! As with any compiler there will be one or two lines of code which may need to be re-written but they are few and far between, certainly fewer than with any of the major commercial compilers for the Atari. This alone is worth ten times the price of the disk! But that's not all! Also included are a few programs written in Turbo Basic including a great Paint style program and a Text Tidier for converting text for those who use comms or transfer text from other computers. These programs are principally to enable you to see how to use Turbo Basic but are excellent on their own. DS#6 includes a complete printed guide to all the new/amended commands of Turbo Basic plus a guide to using the compiler.